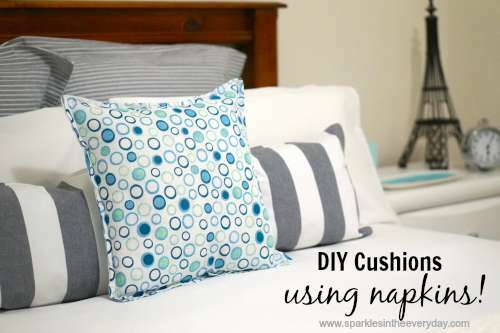 How to make cushions using napkins and placemats!! - Sparkles in the Everyday! You are here: Home / DIY - Art and Craft! / How to make cushions using napkins and placemats!! 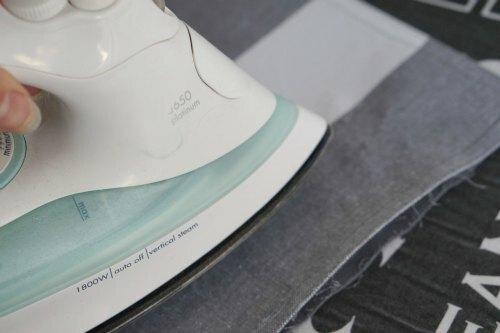 The easy and cheap way to make cushions for your home by using napkins and placemats! All the hints and tips to up-date your space with pretty DIY cushions! Changing up my bedroom for each season is a great way to freshen up the space. The best way to do this is to add some colour….reds and deep browns for winter and fall and fresh, crisp blues, colours and whites for spring and summer. Changing cushions are the best way to get an instant change and feel to a living space. The only problem with changing is the cost!! Pretty cushions from stores can cost anywhere between $20.00 and $50.00 each!! So I came up with an alternative…. a really cheap way to re-style my home for the seasons! 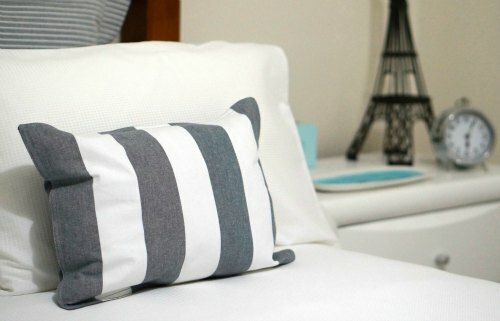 DIY Flange Cushions made with napkins! But…I do use napkins to make cushions! Recently I came across a packet of very pretty napkins – four different patterns in a packet with matching colours. Yes, they were on sale and at $5.00 a pack they were a bargain!! 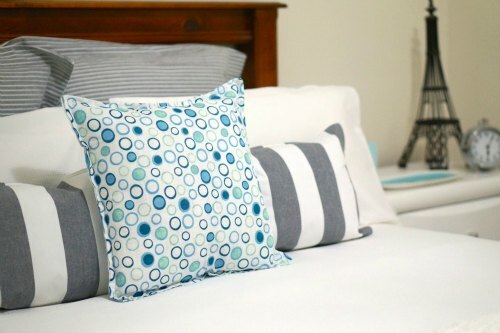 The best part about using napkins to make pillows are that they are already hemmed….and they are the perfect size for cushion inserts – so no cutting! 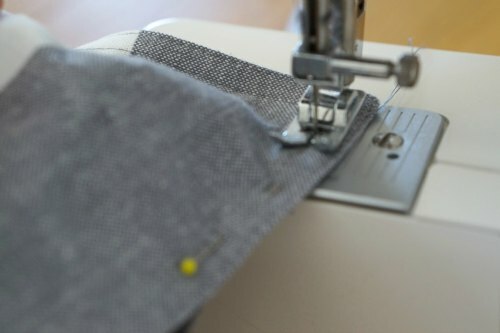 To make a flanged cushion means that you have a nice frill around the edge of the pillow. It looks a lot more professional than simply sewing two pieces of material together , turning it inside-out and adding in the pillow. 2. 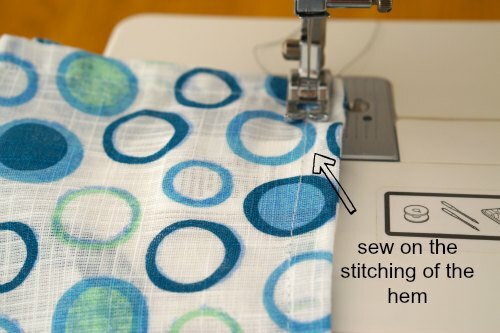 Pin 3 sides and sew (either with a machine or by hand) on the stitching of the hem. This will give you the frill around the edge of the cushion. You can make this as big or as little as you like, but just make sure you measure so the cushion insert will fit. DIY Cushions made with Placemats! As the weather changes, the sales in all the shops pop up. This is the best time to purchase placemats. 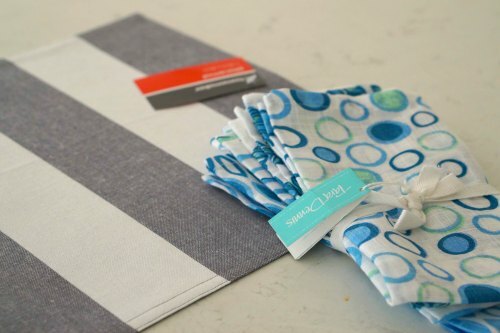 I recently spied some placemats on sale for only $1.00 each and fell in love with the simple but stylish stripes. 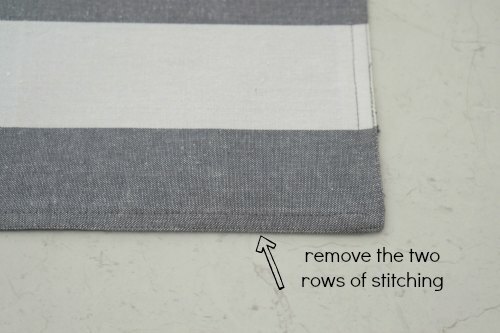 Transforming placemats into cushions is really easy …just follow the 5 easy steps! 2. Using a quick-un-pick, simply un-stitch one side of the placemat. It may have two rows of stitching which this one did. 4. 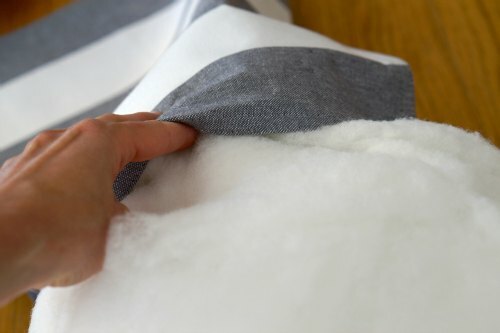 Then fill with the filling from an old pillow (that has been washed). Make sure you fill to the corners of the cushion. 5. 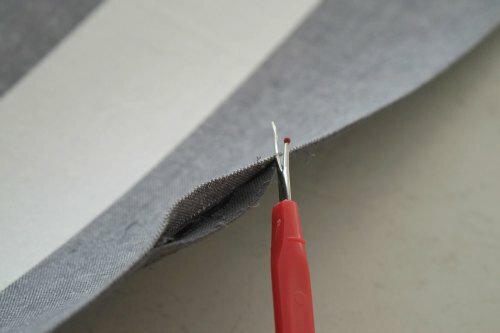 Pin the side closed and using a sewing machine, simply sew up the side. It should be easy to see where to sew as the holes from the previous stitching will be obvious. See….2 new cushions all for the total cost of $2.00!! Let me know what are your tips to changing up your space? 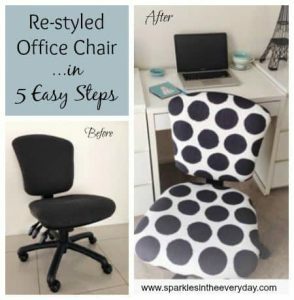 Re-Styled Office Chair in 5 easy steps!! 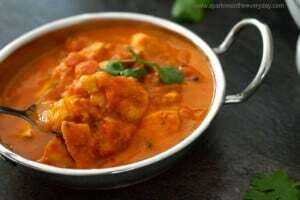 How to make Tomato Chicken Curry …from scratch ! Barb this is fantastic!!! I would have never thought. I am currently working on turning my daughter’s toy storage box into a functional open storage space and use the top as a sitting bench for her visitors and this DIY just might work as my cushions. Thank you great money saver! Just pinned. Neat idea – these look gorgeous! Pinning. I can’t wait to try making these!! Oh my gosh…what a creative idea! 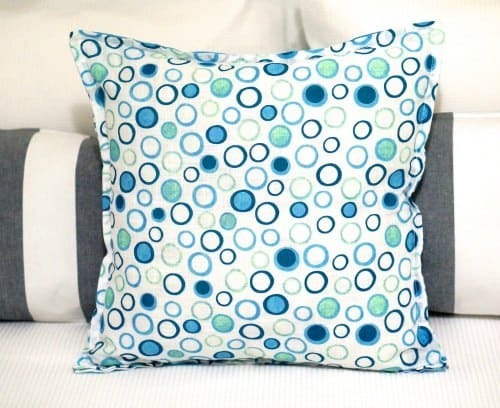 Your pillows turned out so cute and I really love the polka dots! You should really sell these! You made such pretty cushions. Thanks for the tutorial. What a clever idea – Thanks for linking up to Pin Worthy Wednesday, I have pinned your post to the Pin Worthy Wednesday Pinterest Board. This is such a great idea! 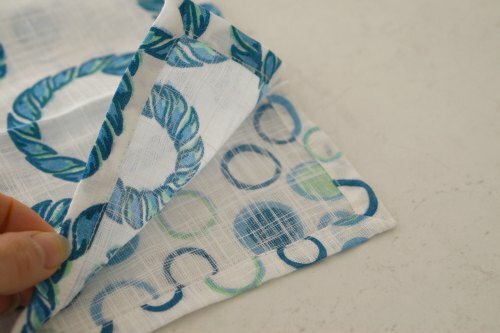 I am always seeing patterns I love on napkins and place mats, but I never buy them because we just don’t use them for dining very often – but making them into pillows is so smart! Those I can always use! 🙂 Thanks for linking up with us at The Creative Circle!